Utagawa Kunisada/Toyokuni III (1786-1865) The 53 Stations of the Tokaido Road, Station #54, Otsu Station, 1852. Oban. Another great print from this famous series. Probably one of the most successful editions of woodblock prints of all time, Kunisada’s inspired and justly famous series of actors and the stations of the Tokaido Road marries two of the most popular genres of ukiyo-e into one theme. Each print, some issued as pairs, depicts a half length actor portrait set against a background of a Tokaido Station scene. The choice of actor, role and landscape remains largely uninterpreted, although in some there are obvious puns and allusions intended. Kunisada didn’t bother to walk the route, sketchbook in hand. Instead he relied on Hiroshige’s prints of the various stations, in this case the Kichizo edition of 1850. 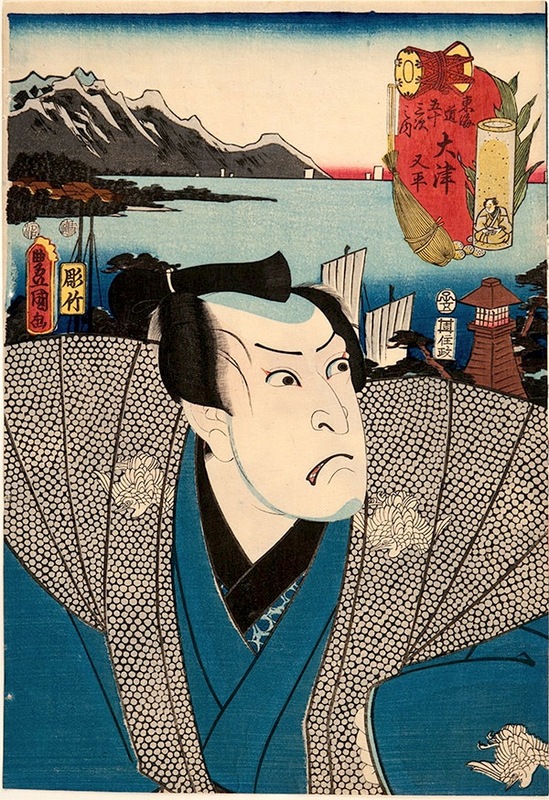 As in the previous entry from the series, Kunisada has taken all of the features from Hiroshige’s picture; the sea view and boats and also the distinctive lighthouse on the right hand side. The portrait is of the actor Nakamura Utaemon III in the third act of the play Keisei Hangoko. Utaemon plays the character of Matahei, a frustrated painter who wishes to have the honour of using his master’s name. After many frustrations he decides with his wife to commit suicide in despair of his talents being recognised. In a final gesture he paints a self portrait on the side of a stone basin and the picture is miraculously transferred to the opposite side. His master, amazed at the miracle confers on him the honour he desires. In celebration, Matahei and his wife Otoku dance to a hand drum, the finale of the play. Kunisada pictures Utaemon in a kimono decorated with the distinctive tsuru-bishi or crane motif he always wore. The cartouche pictures the hand drum used in the famous dance at the end of the play and the stone basin with his self portrait. A terrific print, bold and direct as so many are in this series. Full size with strong unfaded colour, fine impression and only small binding holes at the left edge. Published by Sumiyoshiya Masagoro, censor seals of Hama and Magome, dated rat/5. The carver is Horitake.